Yes if you zoom in, you'll see it rained last night (and today) and I just don't have room to move it in the dry at present. I have looked through the catalogs that were available online and the closest I can determine is maybe a 1976, take a look at the bike though it's still not exactly what's listed in the book. I bought this one for $50 from a guy who bought it from a bike shop in 1994. I believe most if not all the components are original (except for the seat). He had it listed on CL as a 20 year old Peugeot 10 speed, obviously it's not - he just knew it was made in France and Peugeot came to mind when he listed it. I would place it's age to be at least 30 years old. Motobecane had 10 speeds prior to 1984 (maybe earlier than that), they are available in the 1979 and earlier catalogs; however, I could not find one with 2840 tubing. It might be what's in the missing catalogs (maybe a 1977). Serial Number 3666849, 612 underneath that, and a 2 perpendicular to the rest of everything else. Not exactly sure what to do with it at this point, other than clean - lube it up, etc. I may end up giving it to my neice and nephew (sister has 6 kids), or might just keep it (though I really don't have the room, need to get rid of something). I mainly wanted to get the "before" pictures done before I start fixing it up. I'm looking forward to giving it a good cleaning, and shine the chrome on the front forks. Last edited by Bheleu; 08-28-09 at 11:53 AM. ...def need to fix it up now. Saw on e-bay where one had ended at $500 + $65 shipping. Sure it might have sold high, but gives me some confirmation I did the right thing in getting it (despite my wife insisting I didn't need another bike). Are you planning on going with the bar end shifters, also? I can't believe that one on ebay sold for $500. Whoever bought that is really crazy. I have been toying with the thought of buying a motobecane bike. They are the cheapest road bike you can get and I dont want to spend more than $700.00. So it works very well for me to get one. Anyone think this is good or bad idea? Looks like a slightly older version of my 1981 Motobecane Mirage mixte. Based on others I've seen, I would say 1976-77, but not sure. In the Boston area, these go for $200+ on CList and in bike shops, depending on frame size and condition. 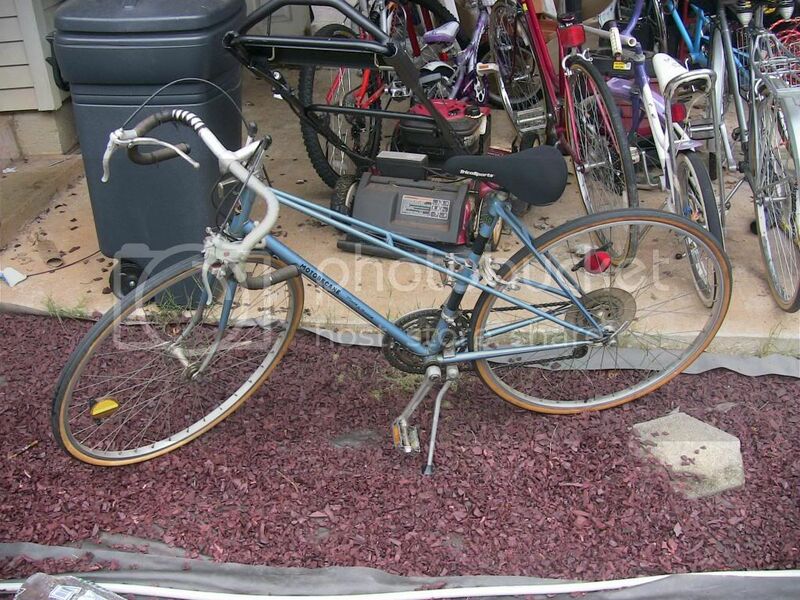 This is a nice bicycle that could make someone very happy; take it indoors and give it some TLC!